Have you ever been woken up at 6am by a flurry of cars and activity outside your window? This happened to us just yesterday. We looked outside and our little street of only four houses was buzzing. Every parking spot taken, people walking the sidewalks, more cars driving slowly looking to join the fray. It was way too early in the morning for a party. We knew our neighbor was considering selling her house, but it was even too early for a realtor open house. Then I realized, this could only be one thing. Our neighbors were having a tag sale! I will admit for a fleeting moment I considered running over to see what they were offering. I’ve been to their house and she is an interior designer with great taste. But mostly she has newer items and my bed was oh-so-comfy. Yet it reminded me of one of my favorite ways to add character to my home. Decorating with antiques and flea market finds is a great way to define your style and lend a sense of history and pedigree to any type of living space. 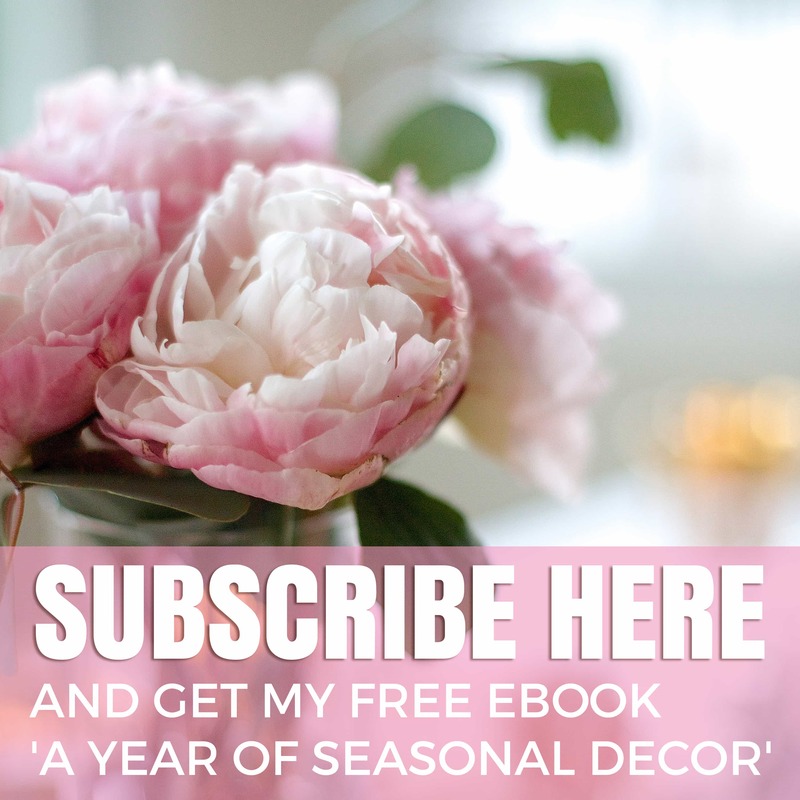 If you like vintage style check out The 6 Defining Style Elements I Use In Every Room. It doesn’t matter if you live in a cottage in France, a tiny New York apartment or a brand new builder’s grade home in a suburban development. Any space can be outfitted with antiques and flea market finds to add a note of French style and a feeling of authenticity. I enjoy adding vintage flavor to all of my spaces, particularly those that involve daily rituals. I find it elevates my enjoyment of these ordinary routines and makes daily life a little more special. For this reason, I especially love to find pieces that follow a theme, like dressing table items for the bedroom, soap dishes and perfume bottles for the bathroom and tableware for the dining areas. For my kitchen table I like to style little vignettes to add a romantic touch to delight me while I eat. Here are 10 ideas for flea market finds to add French style to your kitchen table. 1. 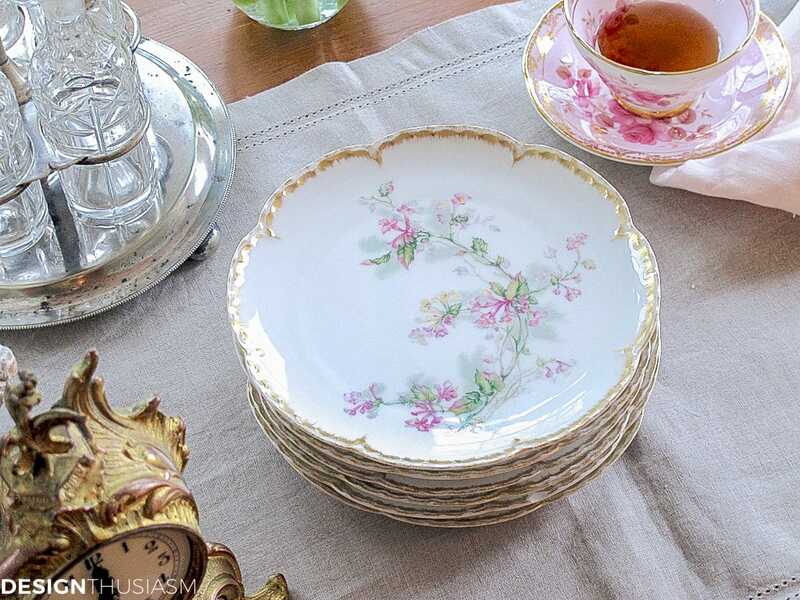 Vintage plates – What better way to enjoy your lunch than on delicate Limoges china plates? Find mix and match pieces or a set with missing or odd numbers. Include them in a stack as part of your vignette and the imperfections won’t matter a bit. 2. Antique linens – Pretty antique linens add a lovely softness to a kitchen table vignette, which might otherwise be comprised of harder collected pieces. A napkin nestled in a box or basket provides the perfect wrapping for bread or sandwiches. Look for feminine embellishments like tonal embroideries, lace edging or tiny ruffles. 3. 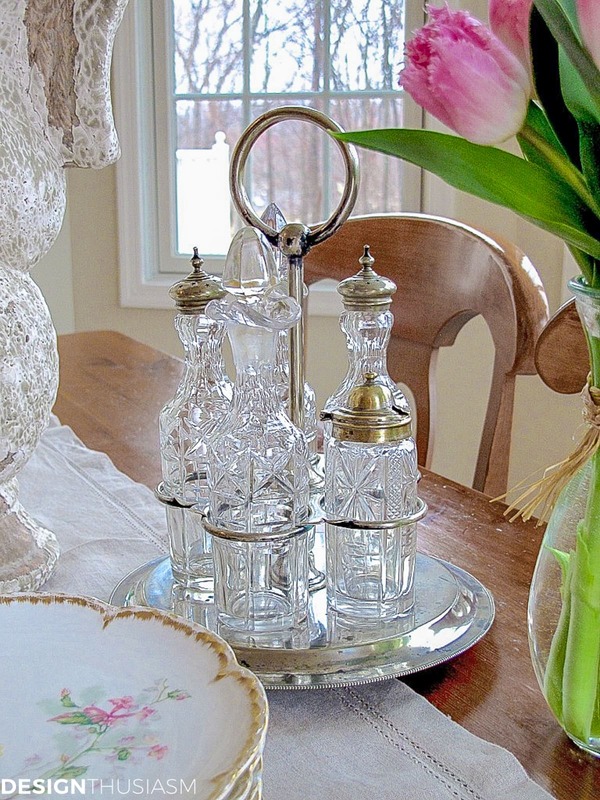 Cruet set – A crystal and silver condiment set adds a nice touch of glimmer to any table, while its aged patina complements the vintage feel of your setting or vignette. You can also try mustard pots holding a cluster of silver utensils or a silver cream and sugar set for a similar purpose. 4. Decorative boxes – Boxes can be used in various rooms to hold an array of things. On my table, this gorgeous silver repoussé box is perfect for presenting small luncheon sandwiches. It’s a recent find that I added to my growing collection which includes decorative boxes in many shapes and sizes. 5. Floral china teacups – I use teacups in almost every room in our house and I love the delicate burst of beauty they add to any styled grouping. The kitchen table is of course a natural place to display them and they should be used daily rather than kept only for show. The teacup, here, is Royal Sutherland from Staffordshire, but I collect a wide mix of varied patterns. 6. Garden statues – One of the easiest ways to impart a gorgeous chippy patina is with vintage garden statues or concrete planters. The older and chippier the better. Cherubs add romance but there are other options to find, as well. 7. 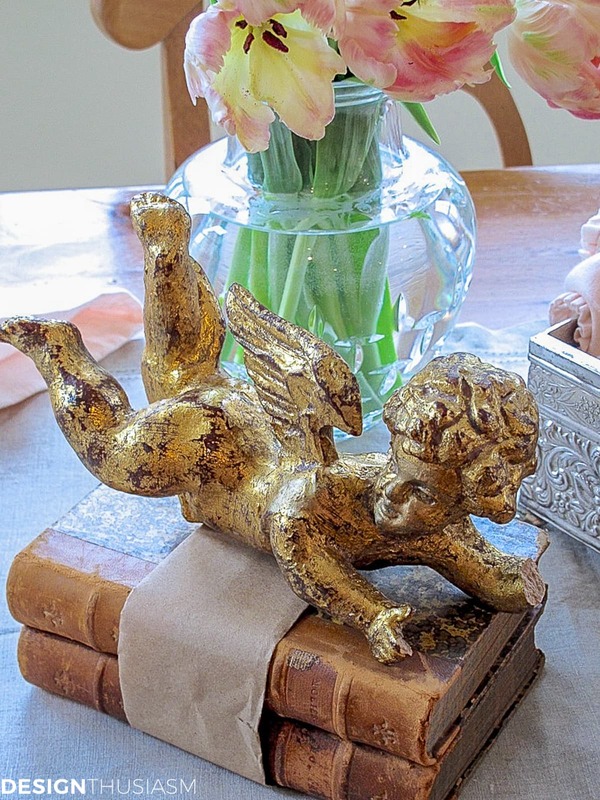 Architectural fragments – I absolutely love using architectural fragments, whether it be large pieces like a mantel or pediment or a tiny fallen bit like a cherub with a missing hand. 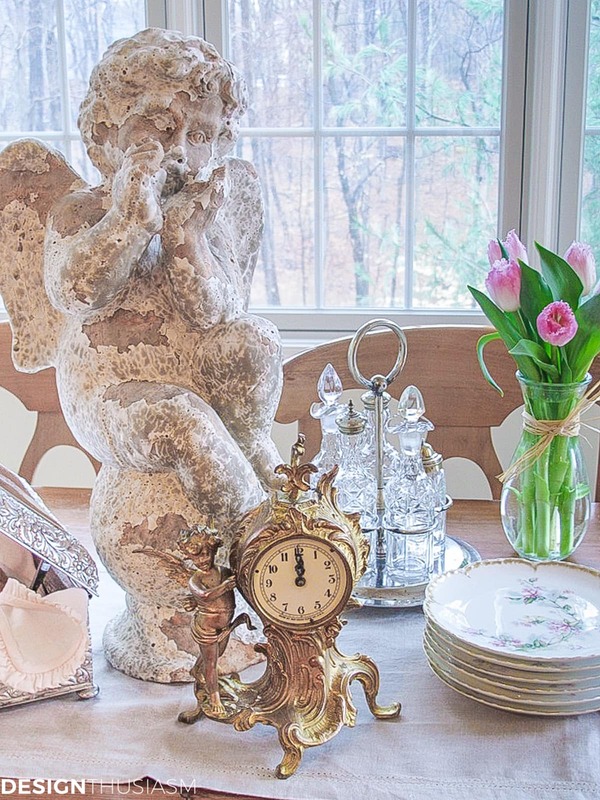 In our kitchen vignette the cherub is purely for fun, but it reflects the visual tone of the rest of the grouping. 8. Old books – In a vignette books can be used as risers to showcase other little vintage bits, or can be displayed under a cloche in the center of the table. One can’t have enough quality vintage books and I prefer to select titles that I’d really want to read. This vintage set of French books is Molière. 9. 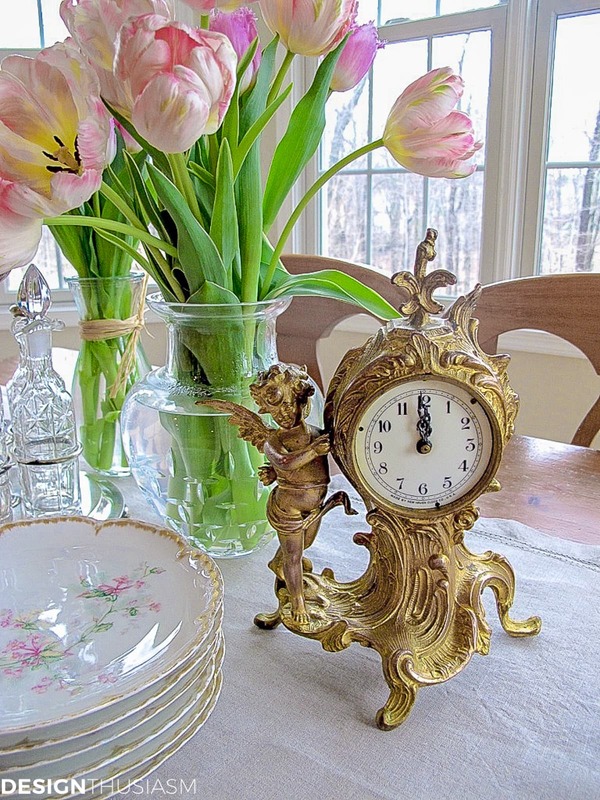 Small clocks – Another piece that’s not necessarily strictly for the kitchen, a lovely French clock is a fun item to decorate your table with. It can serve to announce when it’s time for a meal, but also offers the charming warmth that gilding embodies. 10. Fresh flowers – And always, there are fresh flowers! Try stunning parrot tulips which are fascinating to study, with their soft color distribution and their lilting curves. 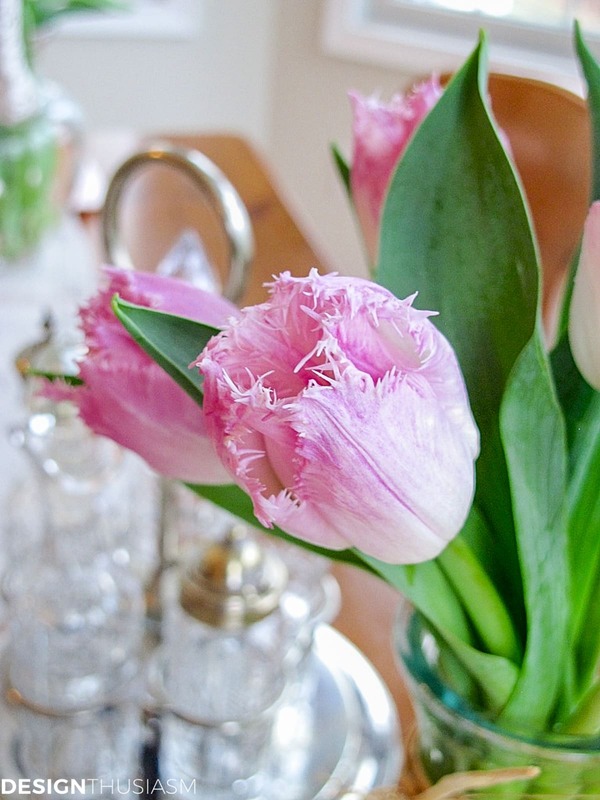 I also love fringe tulips, a delightful reminder that spring is never that far away. 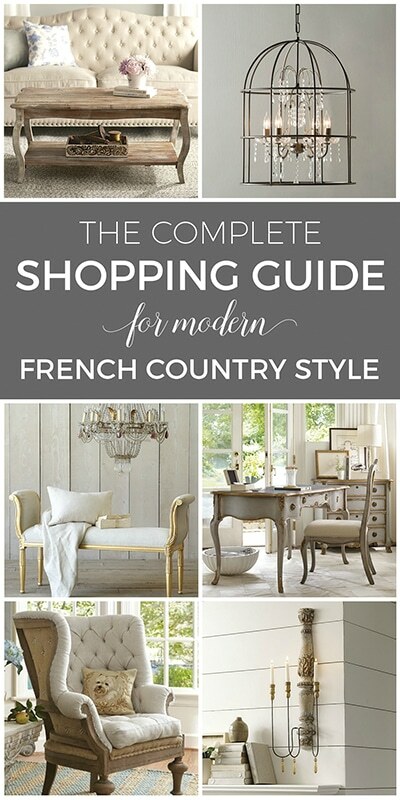 Looking to save money on your French decor? Check out 10 Ways to Stay on Budget by Mixing Real and Faux. Style them all in a freeform vignette and you can even change it up from time to time. Add a linen table runner to tie it all together for a cohesive presentation. 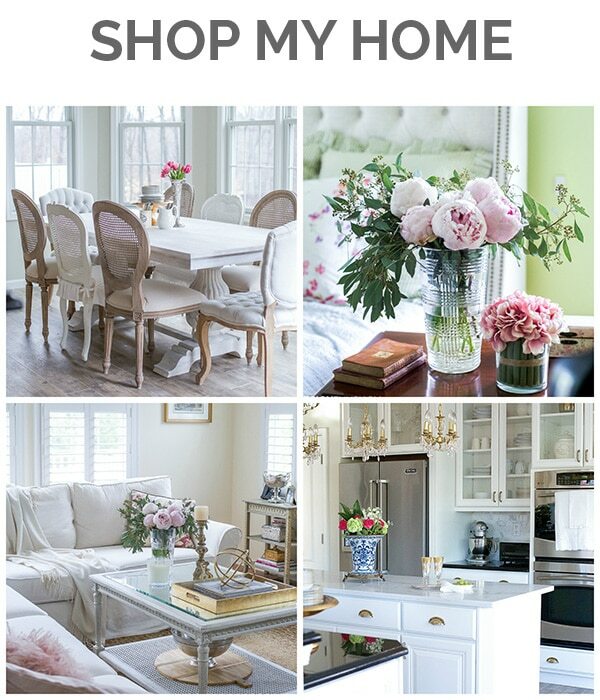 Typically, my favorite pieces are lovely antiques found on my travels abroad or scavenged at a vintage market. But if a trip to France is not in your near future plans, you can always pound the pavement at 6 in the morning underneath someone’s window on your way to a tag sale! Your table depicts your home…..gorgeous!!! 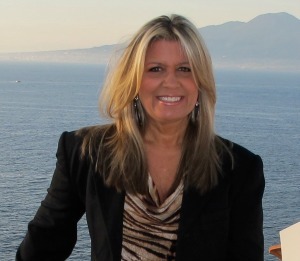 !….Great to party with you Lory!….thanks for the coordination of our group!! Always exquisite settings and vignettes in your home, Lory. I have never seen fringed tulips. Those are so pretty! Thanks, Kim!! I should have bought them the day before, because when they opened they were even prettier… 🙂 Hope you are feeling better!! So very beautiful, Lory! I love those tulips, especially. Thank you so much, Rachel! We’re lucky this time we had no only French design to work with, but the benefit of spring… 😉 Delighted to be posting with you!! Those tulips! I’ve never seen any like them and I love your dishes so much. Thanks so much, Janet!! Funny, I was looking for hyacinths, but found the tulips instead… 🙂 Serendipity!! 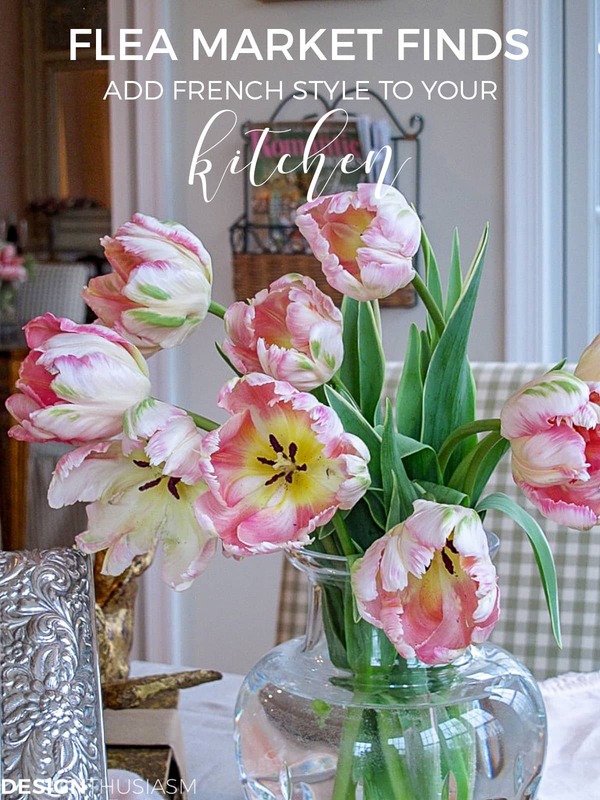 This is breathtaking beautiful, I adore these fringed tulips and the dreamy light flowing through your windows is magical!! Thank you, Jemma! I would certainly prefer to see the trees in bloom outside, but for now, the light and the tulips are just fine… 😉 Thanks for visiting!! Outstanding vignette, Lory! Love the freeform with more elements of varying heights– looks far more interesting than just one focal point, especially with the ones you’ve chosen. 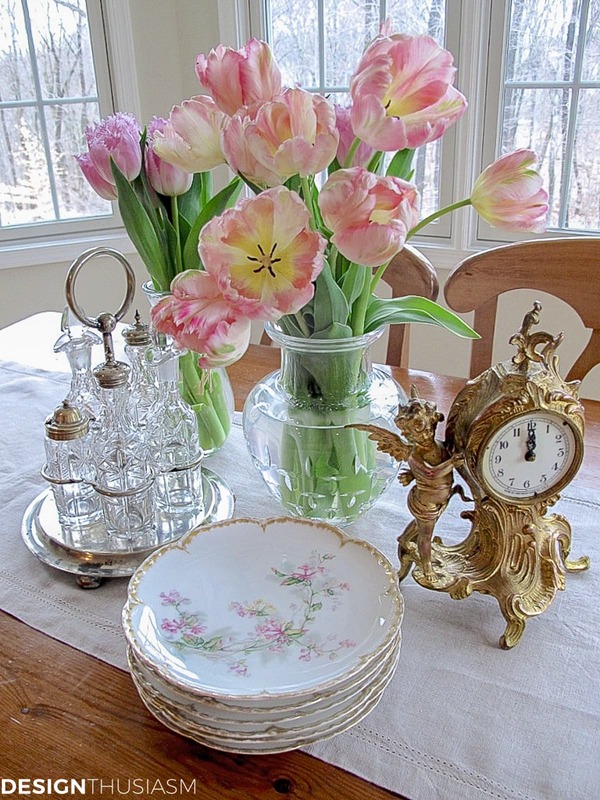 Tulips and peonies are my most favorite flowers, and that beautiful clock….oh my! Btw, there are no insides to that clock, but I didn’t care! It’s just so beautiful here Lory, sorry I did not join in, but I am baxk on tract now! Been super busy with a job site developer. This is a beautiful setting to start out my weekend. 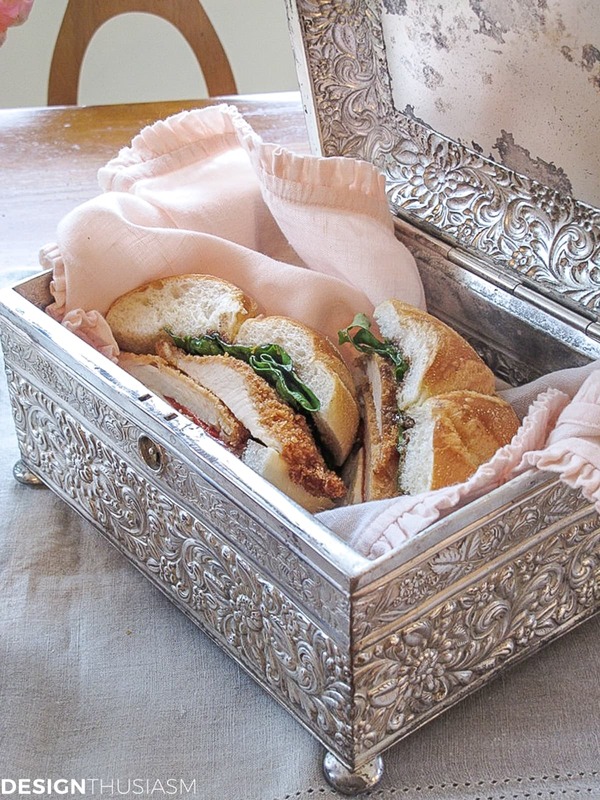 You my dear give new beautiful meaning to the breadbox….it really inspires me with a French luncheon. Stunning. An elegant and charming table to enjoy lunch. I love that exquisite cherub clock. So beautiful!! Love the sandwiches in the silver box! Thanks for joining Home Sweet Home! I love all of your pretties! What a nice collection and lovely photos too. Thanks so much, Anita! And this was before the new camera… 😉 Hoping to upgrade my photos in time. I was a very country style in my previous home. 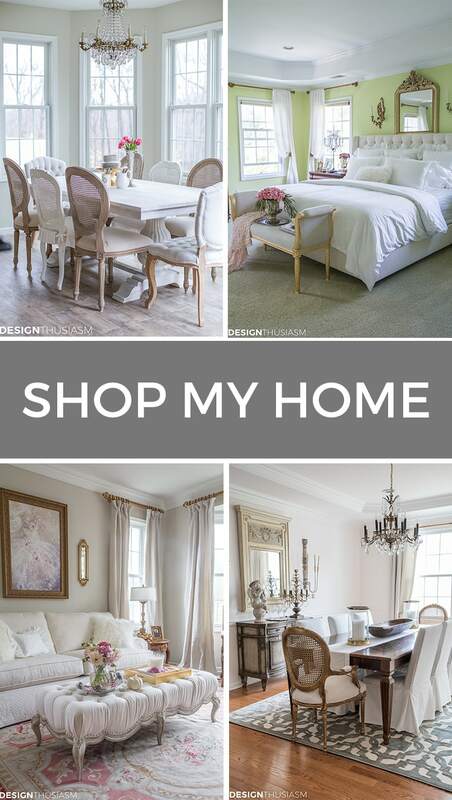 I had to to give away all my furniture, decisions and lots of country things…why… Because all my life I was in love with French country… Now I moved to a 2/2 flat and I am learning to see what and how to deco with country French style. Tks for this free subscription! Trying to comply with my palest in blues and the Reds for my living room. I hope to send you a picture so you can see it if is right or wrong. Meanwhile, Tks ❤️? My pleasure and I’m so glad you are enjoying! 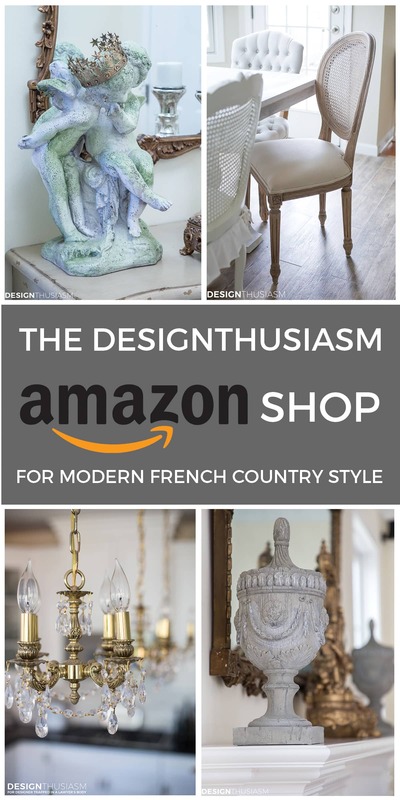 🙂 You can certainly do country French style in any place you live!! You’ve created a lovely setting for your table. The parrot tulips are gorgeous. I never see those when I go to purchase tulips. The limoges plates are lovely- such a pretty and delicate pattern.